Today we went to see the film Goodbye Christopher Robin. It was very good. I, like most children, read Pooh books as a child. I got interested in their author, A.A. Milne, when I discovered that he’d done a mathematics degree at Cambridge. So had my scientific hero A.V. Hill, and (through twitter) I met AV’s granddaughter, Alison Hill. I learned that AV loved to quote A.A.Milne’s poem, OBE. And he–thank God!–has the O.B.E. And she–thank God!–has the O.B.E. He died without the O.B.E. This poem clearly reflects Milne’s experience in WW1. He was at the Battle of the Somme, despite describing himself as a pacifist. In the film he’s portrayed as suffering from PTSD (shell shock as it used to be called). The sound of a balloon popping could trigger a crisis. He was from a wealthy background. He, and his wife Daphne, employed a nanny and maid. 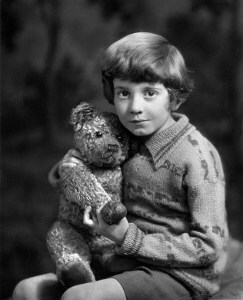 The first Pooh book, When We Were Very Young, came out in 1924, when Milne’s son, Christopher Robin, was four. The nanny is, in some ways, the hero of the film. It was she, not his parents, who looked after Christopher Robin, and the child loved her. In contrast, his parents were distant and uncommunicative. By today’s standards, Christopher Robin’s upbringing looks almost like child neglect. One can only speculate about how much his father’s PTSD was to blame for this. But his mother had no such excuse. It seems likely to me that part of the blame attaches to the fact that Milne was brought up as an “English gentleman”. Looking after children was a job for nannies, not parents. Milne went to a private school (Westminster), and Christopher Robin was sent to private schools. At 13 he was sent away from his parents, to Stowe school, where he suffered a lot of bullying. That is a problem that’s endemic and it’s particularly bad in private boarding schools. I have seen it at first hand. I went to what was known at the time as a direct grant school, and I was a day boy. But the school did its best to ape a private school. It was a cold and cruel place. Once, I came off my bike and went head first into a sandstone wall. While recovering in the matron’s room I looked at some of the books there. They were mostly ancient boys’ stories that lauded the virtues of the British Empire. Even at 13, I was horrified. After he reached the age of 9, Christopher Robin resented increasingly what he came to see as his parents’ exploitation of his childhood. After WW2, Christopher Robin got married but his parents didn’t approve of his choice. He became estranged from his parents, and went to run a bookshop in Dartmouth (Devon). Once his father died, he did not see his mother during the 15 years that passed before her death. Even when she was on her deathbed, she refused to see her son. It’s a sad story, and the film conveys that well. I wonder whether it might have been different if it were not for the horrors of WW1 and the horrors of the upbringing of English gentlemen. 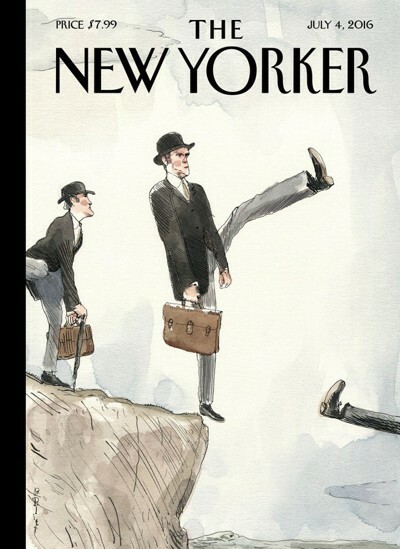 Just look at at this recent New Yorker cover. Look at Jacob Rees-Mogg. And look at Brexit. Clearly you understand that it is inappropriate to demand that someone else lives out your fantasies for you. If only this were standard practice in medicine! Sadly, and in spite of community pressure, the Harbour Bookshop (one run by Christopher Milne) closed two year’s ago. It is now a print gallery. We do now have a Community Bookshop, round the corner from the old. Christopher is remembered fondly by many in the town. Dr Richard Rawlins, Kingswear, Dartmouth, Devon.